Manufacturers rely at this point on front airbags, side and curtain type to protect the knee. Toyota also said however that there is room for one, so will this offer this type of IQ on a new type of air bag. This is an airbag that protects heads of rear passengers in the event of a rear impact. 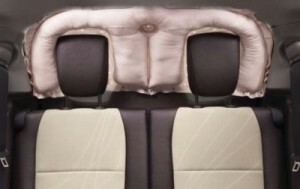 The airbag is positioned in the upper edge of rear and covers the whole area when it is triggered (behind the head restraints). The Japanese said that the airbag is very useful in the event of a rear impact, although it seems that head restraints help more in this situation than the airbag. Toyota said that the airbag minimizes the risk that certain parts of the car get in contact with the heads of passengers.